Acknowledged author wrote MANAGERIAL ECON & BUS STRATEGY 9 comprising 576 pages back in 2016. Textbook and etextbook are published under ISBN 1259290611 and 9781259290619. 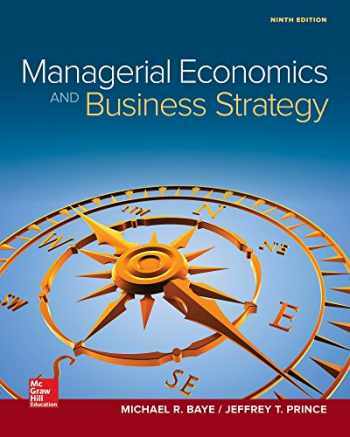 Since then MANAGERIAL ECON & BUS STRATEGY 9 textbook received total rating of 4 stars and was available to sell back to BooksRun online for the top buyback price of $64.43 or rent at the marketplace. This ninth edition of Managerial Economics and Business Strategy has been revised to include updated examples and problems, but it retains all of the basic content that made previous editions a success. By teaching managers the practical utility of basic economic tools such as present value analysis, supply and demand, regression, indifference curves, isoquants, production, costs, and the basic models of perfect competition, monopoly, and monopolistic competition. This edition retails the emphasis on real-world examples and modern topics along with unique coverage found nowhere else: oligopoly, penetration pricing, multistage and repeated games, foreclosure, contracting, vertical and horizontal integration, networks, bargaining, predatory pricing, principal–agent problems, raising rivals’ costs, adverse selection, auctions, screening and signaling, search, limit pricing, and a host of other pricing strategies for firms enjoying market power. This balanced coverage of traditional and modern microeconomic tools makes it appropriate for a wide variety of managerial economics classrooms.